San Diego Comic-Con is a week away. Cue the panicked Flight of the Bumblebee music. It's a fun experience - I wouldn't have attended it for the past nine years if it wasn't - but it's definitely stressful. I haven't attended as a fan for a few years now, but I remember even that coming with a certain amount of crazy. First of all, it's tricky just to get a badge. If you're lucky enough to score one, you still have to figure out where you're going to sleep. I'm not even going to start on the costs associated with all of that. Then, you're faced with countless decisions. Which offsite events to check out? Which panels to see and how long to set aside for standing in line? Where to eat? What exclusives to try to obtain? It's exhausting. The Nerdy Girlie has some tips to help you make the most of the event if you're attending the convention as a fan. I still get some fan experiences in, but Comic-Con is mostly about work for me. I've covered the convention for IGN, Backstage, and Fashionably Geek. I've done video interviews for Blastoff Comics, too. This year is a mix of all that plus some cosplay for Adafruit and coverage for my web series with Shout! Factory, Con Woman. Whew. Because I'm always interested in other perspectives of events, I thought I'd share a little of what it's like to cover Comic-Con as press. Keep in mind, this is different for everyone. There are at least a bajillion outlets at the convention covering specifics like toys, comics, or cosplay and catch-all outlets covering a little of everything. Because I mostly do stuff for IGN, I cover a lot of television and some film. My schedule usually includes panels, roundtables, and maybe a press line or two. I also try to spend time taking photos during the convention. Evenings involve the occasional screening and networking thing, but mostly I try to leave them for wrapping up writing and hanging out with friends. - Prep my messenger bag. I always have: my laptop (it's tiny and pretty light), the power cord and mouse (my trackpad stopped working when I spilled a drop of water on it), business cards, pens, a Sharpie, hand sanitizer, wallet, Comic-Con badge, gum or mints, two voice recorders and an extra set of batteries, my iPhone, my iPhone cable and plug, a portable charging unit, headphones, small point and shoot camera, a snack or two, a bottle of water, my notebook with my schedule and any interview questions I have etc, and if I'm shooting my web series, my Go-Pro and stand for it. - Breakfast at the hotel. It's typically the biggest meal I eat every day so I pile the plate high and grab a banana for later. - Go between the exhibit hall, panel rooms, and the Hilton Bayfront and whatever hotel IGN is set up in. There is a loooot of walking. And feeling guilty about getting access to panels that others have waited hours in line for (I know I'm working, but I can never shake that feeling). After panels, I'll usually find a quiet place to sit and tidy up my notes and get an article published as quickly as possible. The free wifi in the lobby area downstairs always works well for me. - Wrap up the day anywhere from 6-8pm, go to the hotel to finish uploading urgent stories and photos, empty out all the business cards and swag that got shoved in my face out of my bag, shower and change, head out for a few hours. I finish up any lingering posts before bed. I try to leave all transcribing from roundtables until after the convention is over because we all know how much fun transcribing is. - If I have energy before bed, I'll prep interview questions for the next day and/or pack my bag. This year I'll be adding in grabbing footage and performing interviews for Con Woman. It's a busy weekend. It's a blast, and I'm thrilled I get to do stuff like interview The Hunger Games cast or sit in on the Game of Thrones panel for work. But, it is a marathon. Sometimes friends don't always understand that you can't hang or meet them at an offsite event. I wouldn't change anything though. Working at San Diego helps offset the cost of attending (really though, I could fix that by not attending at all), and it's an exciting environment. In the moments when I'm not feeling tired, I sort of get high off all the rushing around and urgency. Is it next Wednesday yet? Who else is attending Comic-Con this year? I've always wondered what it was like to do a con as a member of the press! Thanks for the glimpse into that. Have fun next week! Wish I could be there! I'll be there for the first time ever! So excited, and a little nervous too. I expect it to be crazy! Thanks for this perspective. 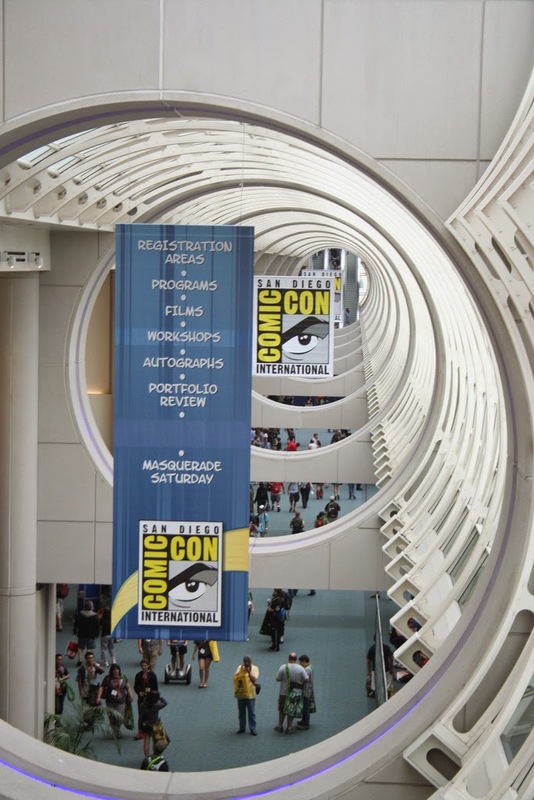 I'll be attending my first SDCC as a member of the press. Yeah, I try to avoid lines that require me sleeping outside. I'm glad this was helpful! I'm planning to write about more process sort of stuff in the near future. Have fun at Phoenix Comicon! i hope u article can useful for everyone .